First of all, apologies again to those of you who received an e-mail telling you I had updated the blog (with the Lane Fox video) and followed a link to nowhere. Not for the first time I published it with the wrong ‘byline’. 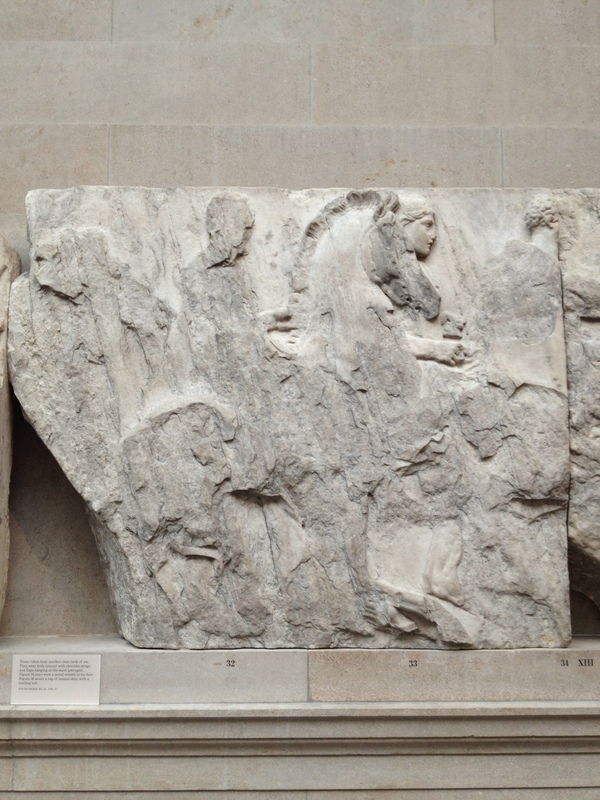 A few weeks ago I visited the British Museum and made a rare foray into the Parthenon rooms. I took a few photographs. This one is my favourite. As you can see, the frieze has been much damaged; so-much-so that to me it looks like the horse rider is now hidden from us behind a sheet of dark rain. Rain is a very evocative literary device; for me, nowhere more so than at the end of The Lord of the Rings, when the elven ship carrying Bilbo, Frodo, and the elves to Valinor passes out of our dimension and into the elves’, after passing through a sheet of rain. … the ship went out into the High Sea and passed on into the West, until at last on a night of rain Frodo smelled a sweet fragrance on the air and heard the sound of singing that came over the water. And then it seemed to him that as in his dream in the house of Bombadil, the grey rain-curtain turned all to silver glass and was rolled back, and he beheld white shores and beyond them a far green country under a swift sunrise. This is really what I, and perhaps any of us who engage with the past, are trying to do – pull back the grey rain-curtain of our own ignorance, and other people’s notions, in order to discover Alexander et al for ourselves. When I first saw the above pictured frieze I thought it reminded me of a scene from a film noir, now, it rather comes across as a metaphor for how we meet the past and what we must do in order to discover it.